Is Heart Disease from a Sulfur Deficiency? We normally don’t think much about it, but sulfur is a hugely important nutrient for the body, and when we lack this critical substance, we may be paying for it with the health of our hearts. Sulfur is a non-metallic element (number 16) that is a critical nutrient for the body. Unfortunately, so many people don’t consume enough. Over the years, it has been forgotten by the FDA and not added to grains/rice as part of the “fortification” process. Sadly, most diets are deficient in sulfur rich foods like grass fed beef, garlic, onion, and quality eggs. Farmers are not putting sulfur in the soil or feed, therefore plant and animal sulfur content is diminished. The quality of veggies depends on the soil in which they grow. Animals eat those plants. Sulfur is also found naturally in spring water. If you use reverse osmosis, the sulfur is removed. Sulfur is one of the top 10 most abundant nutrients in the body. There is about the same amount of sulfur as potassium, and there is more sulfur than sodium. It is an essential element for human life and combines with so many other nutrients including amino acids (building blocks for proteins), metals (sulfur clears them out of the body), vitamins, and even makes our skin, hair, and nails strong. You can thank sulfur for the smell of garlic or the whiff of a skunk. Rotting eggs, same thing. · Detoxifier that binds toxins and metals, making them water soluble, and easy to excrete from the body. Wow, that is a mouthful. But hang in there. As noted in the picture above, lining all major blood vessels is a layer of cells called the endothelium. These cells control what comes into the artery wall and what stays in the inside area of blood flow called the lumen. 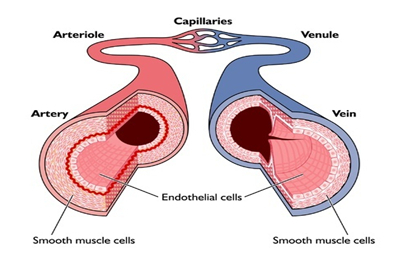 Interestingly, there is a space that serves as a buffer between blood flow and the endothelium. This area is called the glycocalyx and researchers are only scratching the surface at its importance. One nutrient that is found extensively in the glycocalyx is sulfur. Given most diets are deficient in sulfur, could this be a major factor in atherosclerosis? Amino acids are the building blocks of proteins. Some of these amino acids such as cysteine, methionine, and cystine contain sulfur. Cysteine is an important amino acid for the building of glutathione mentioned above. Methionine cannot be manufactured by the body and is considered an essential amino acid. Cysteine and cystine can be made, but an adequate supply of sulfur is needed. Homocysteine and taurine are similar to amino acids, contain sulfur, and are very important molecules in human biochemistry. When homocysteine gets out of control, bad things happen (2) including heart attacks, strokes, cancer and dementia. On the flip side, low homocysteine is also a problem. We are looking for levels between 5 and 7. Taurine is a component of bile salt for digestion and is known to reduce blood pressure and prevent heart rhythm issues (3). Alpha-lipoic acid contains a sulfur molecule and also does some amazing things in the body (4) such as lowering oxidative stress, lowers blood sugar by improving insulin function, chelation, and lowers blood pressure by improving endothelial function. Sulfur is found in many foods such a Brussels Sprouts, broccoli, cabbage, and onion. But my favorite sources are seafood, eggs, and of course, garlic. Just to be clear, eggs do not cause heart disease as reviewed in a recent article (5). In fact, eggs raise HDL and improve HDL function (6) and improve blood sugar (7). Don’t fear the egg and don’t fear the smell of garlic. That smell is health. · Anti-cancer. Lowers prostate cancer risk by 23%. Lowers lung cancer risk by 44%. Raw milk is an excellent source of sulfur when it comes from grass-fed, pasture-raised animals. When protein in dairy is an amazing source of cysteine. Pasteurization may negate some of the benefit of whey (10). Eat and drink dairy in the raw. Most spring water contains naturally occurring sulfur. But no brand compares with Pellegrino. Sure, you can add sulfur to water, but Pellegrino is an excellent choice and my favorite beverage. You can add some citrus juice or herbal tea to create a refreshing drink, especially in the summer. Credit Dr. George Mann MD in 1960 with demonstrating that sulfur supplementation protects monkeys from atherosclerosis (11). This is the same Dr. Mann who was a fierce critic of the cholesterol-sat fat-heart disease hypothesis and opponent to Ancel Keyes MD. There are many choices when it comes to supplementing for sulfur. The most well-known and studied is MSM. Only found in small amounts in food, MSM contains sulfur and is used for conditions ranging from arthritis to leaky gut to inflammation and oxidative stress (12). NAC and alpha lipoic acid have been used with success. Glutathione is typically not well absorbed orally but newer forms of liposomal glutathione and topical preparations may be better options. Garlic supplements have plenty of data and there are some excellent companies including Kyolic and Biotics Research. Another option is purified chondroitin sulfates. The credit for this research starts with Lester Morrison MD in the 1970’s. But recent data confirms the role of chondroitin sulfate in heart disease. It interferes with the pro-inflammatory activation of monocytes and endothelial cells driven by TNF-α. This serves to lower cardiac risk (13). As mentioned above, heparan sulfate, chondroitin sulfate, dermatan sulfate, keratan sulfate are all major components of the glycocalyx and healthy endothelial cell function. When it comes to the toxicity of glyphosate, Stephanie Seneff PhD is the authority. She views coronary artery disease as a deficiency is cholesterol sulfate. And what inhibits the formation of cholesterol sulfate? That’s right, glyphosate (14). Not only does glyphosate destroy gut bacteria, but it inhibits the trans-sulfuration pathway. Read more from Dr. Seneff about the devastation caused from glyphosate. However you choose to do it, get more sulfate into your diet. Given the fact that sulfur containing foods and garlic supplements are proven to lower heart disease risk, this advice is just what the doctor ordered. Your heart, blood vessels, and the rest of your body will thank you. Now it’s time for me to prepare our dinner of wild salmon with garlic aioli and a side of steamed organic Brussels sprouts. Maybe I will wash it down with a cool glass of Pellegrino. Cheers. 1. Sies, H. Glutathione and Its Role in Cellular Functions. Free Radical Biology and Medicine Volume 27, Issues 9–10, November 1999, Pages 916–921. 2. McKully, K. Homocysteine and the Pathogenesis of Atherosclerosis. Expert Rev Clin Pharmacol. 2015 Mar;8(2):211-9. 3. Chen W. Taurine and Metabolic Syndrome. Food Funct. 2016 Apr 20;7(4):1849-63. 4. Skibska B. The Protective Effect of Lipoic Acid. Oxid Med Cell Longev. 2015;2015:313021. 5. Shin JY. Eggs and Cardiovascular Disease. Am J Clin Nutr. 2013 Jul;98(1):146-59. 6. Fernandez ML. Food Funct. 2010 Nov;1(2):156-60. 7. Fuller NR. Nutrients. 2015 Sep 3;7(9):7399-420. 8. Bayan L. Garlic: A review of potential therapeutic effects. Avicenna J Phytomed. 2014. Jan-Feb; 1-14. 9. Asian Pacific Journal of Cancer Prevention. VOL. 14, 2013 Issue 7. 4131-34. 10. Carbonaro M. J. Agric. Food Chem. , 1997, 45 (1), pp 95–100. 11. Mann G. Effects of Sulfur Compounds on Hypercholesterolemia and Growth in Monkeys. Am J Clin Nutr. 1960; 8:491-7. 12. Iran J Pharm Res. 2013 Fall;12(4):845-53. 13. Melgar- Lesmes P. Treatment with chondroitin sulfate to modulate inflammation and atherogenesis. Atherosclerosis 2016 Feb; 245: 82-7. 14. Seneff S. Interdiscip Toxicol. 2013; Vol. 6(4): 159–184. The Paleo Cardiologist, The Natural Way to Heart Health is the new book by Dr. Jack Wolfson. Prevent heart disease with nutrition, chemical avoidance, sleep, relaxation, and exercise. Learn the Top 20 Heart Supplements and the Top 20 Heart Tests. Book is available on our website now, thedrswolfson.com. Written by: Dr. Jack Wolfson on September 7, 2016. What’s Wrong With My Stomach?